BOSTON — The 19th-century aesthete Walter Pater likened Luca della Robbia’s sculptures to “fragments of the milky sky itself, fallen into the cool streets, and breaking into the darkened churches.” These appealing creations, which still brighten the penumbras of Florentine chapels, will warm the hearts of visitors to “Della Robbia: Sculpting With Color in Renaissance Florence” at the Museum of Fine Arts, the first American exhibition devoted to the artist and his disciples. Organized by Marietta Cambareri, the museum’s curator of decorative arts and sculpture and author of the excellent exhibition book, the show is a feast for the eyes and a splendid introduction to the lustrously colored, glazed terra-cotta sculpture of the undervalued Luca and several generations of his worthy, but even more neglected, descendants and followers. 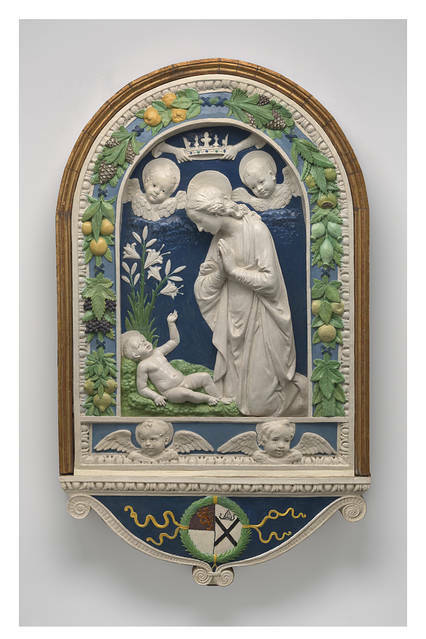 The artists of the Della Robbia family are often ignored because they are considered mere decorative ceramists. But the MFA display proves that they are among the most accomplished sculptors of the Florentine Renaissance. ‘The Visitation’ (c. 1445), by Luca della Robbia. Luca della Robbia (c.1400-1482), the clan’s paterfamilias, is best known for his marble Cantoria or choir loft (1431-38) made for the Cathedral of Florence. Although his earliest documented work, it reveals the hand of an already experienced and talented stone sculptor. Indeed, as early as 1435, the influential humanist architect Leon Battista Alberti ranked Luca as one of the leading artists of Florence, alongside Masaccio and Donatello, two founders of Florentine Renaissance art. Shortly after the completion of the Cantoria, Luca turned from carving stone to making glazed terra-cotta statues and reliefs, perhaps because there was a greater market for them. Long before Luca, Florentine potters glazed terra-cotta jars and plates, but he was the first artist to successfully adapt the medium for sculpture. Glazed terra cotta (baked earth) had humble origins. It started with riverbed clay (the Della Robbias got theirs from the Arno). This malleable material was used to model figures or to make molds for replication. These were then fired in a furnace. Large or complicated sculptures were made in separate sections to be assembled later. The objects were then painted with colored glazes made of silicon, tin and lead oxides with other ingredients (the exact formula of the Della Robbias was a closely held trade secret). The result was a colorful, glossy, hard, water-resistant surface that, unlike tempera, oil, or fresco painting, does not fade. Remarkably, visitors to the MFA will see colors exactly as Luca’s contemporaries did over five centuries ago, something that alone merits a visit. But Luca’s palette extends far beyond the milky white or the cerulean blue colors for which he is most famous. A “Madonna and Child” (c. 1450-60) from the Florentine Oratory of San Tommaso Aquino demonstrates the range of Luca’s palette. The pensive Virgin wears a blue robe lined in green over a deep purple dress, and like the charming infant Christ in her lap, she has bright golden hair. ‘The Adoration of the Child’ (after 1477), by Andrea della Robbia. The show’s 48 objects provide a comprehensive view of the production of the Della Robbia workshop from Luca to Girolamo (d. 1566), the last of the long-lived line. The objects range from small images meant for domestic worship to altarpieces and nearly life-size figures, most notably Luca’s “Visitation” (c. 1445) from the church of San Giovanni Fuorcivitas, Pistoia. 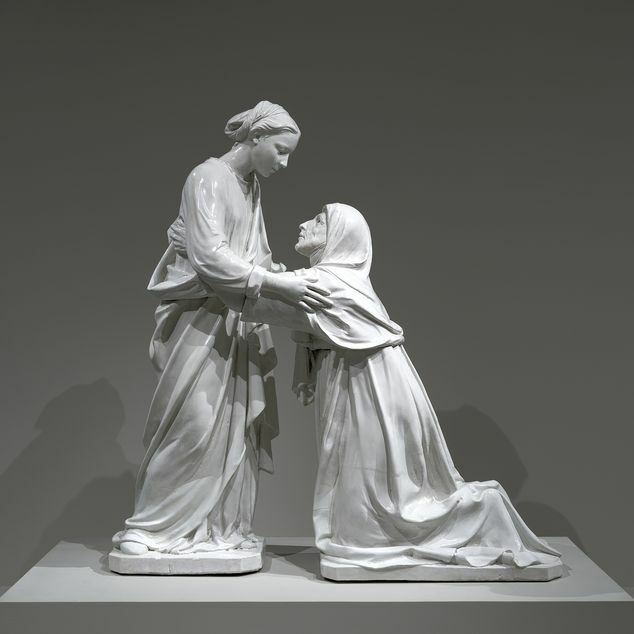 Here the wizened Elizabeth kneels before the beautiful Virgin, their arms intermeshed in tender embrace, the purity of the encounter conveyed by the unembellished whiteness of the figures. Although just over 3 feet tall, this masterly, fully round, rare monochromatic group is as monumentally conceived as the life-size statues carved three decades earlier for the façade of the Cathedral of Florence byNanni di Banco and Donatello, artists who influenced the young Luca. A garland of leaves intertwined with grapes, lemons, apples and pears borders the “Adoration of the Child” (after 1477) by Luca’s nephew and best student Andrea. These luxuriant swags of rich blues, yellows, greens and purples are marques of the Della Robbia workshop. Similar garlands, these featuring squirrels, snakes and pinecones, border the large (about 5 feet wide) lunette of the “Resurrection of Christ” (c. 1520-25) by Andrea’s son Giovanni. Originally part of the garden gate of a villa owned by the prominent Antinori family of Florence, this powerful, spatially complex work includes a portrait of an Antinori donor. Giovanni’s composition is based on Luca’s earliest (1442-45) known glazed terra cotta, also a lunette, in the Cathedral of Florence. But the restraint of color and emotion in that sculpture has been replaced, over 75 years later, by brighter, less subtle colors and figures who are more fervent in gesture and expression. The several sculptures of the later Della Robbias and their last followers, Benedetto and Santi Buglioni, demonstrate the decline of glazed terra-cotta sculpture from its apex in the hands of Luca and Andrea. The one problem with the show is wall texts that group the sculptures under the rubrics of Hope, Love and Faith. Presumably employed to impose some sort of thematic order, these categories will only confuse the visitor, since each of these virtues is on display in every work. But this is a quibble about a joyful, uplifting exhibition that eschews today’s faddish academic theoretical cant in favor of a clear, object-oriented presentation of the works of art. Mr. Cole, a former chairman of the National Endowment for the Humanities, is a senior scholar at the Ethics and Public Policy Center.